The episode is available on the Beyond the Book web site and through your favorite podcast listening platform. As you think ahead to April 26, consider the women in your community who are creators. Could you hold a celebration of their work (creativity)? Are some of them patent holders? If yes, could you have an event where young girls and women can interact with them, and gain some inspiration? Would you want to gather personal histories or photos, to place in local history or share through social media? Yes...there are lots of options/opportunities, so grab one and run with it! If you want promotional materials, there are some on the WIPO web site which you can use. I want to highlight that I am giving three copyright workshops over the next four weeks. The first two are online, while the third is on-site in Florida Yes, the content of the SWFLN workshop will be different than the two for ALA! Please follow the links for more information. Feb. 28, 2:30-4:00 p.m. ET - Presenting "Understanding and Defending Copyright in Your Library: An Introduction - Part 1" (webinar) for ALA Editions. Series Description: Library staffs are often seen as defenders of copyright. Indeed, copyright touches many things a library and its community do. This two-part copyright webinar will help you understand what copyright is (and isn’t) so you can defend how your library and users/patrons/community use print and digital materials. Session Description: The fact that the Office of Copyright exists within the Library of Congress conveys its importance to libraries and the information industry. Yet we often ignore the details in the U.S. copyright law, because we perceive those details as being too complex. One area where we show of lack of knowledge is with the public domain. We are quick to say that something is in the public domain, but do we actually know how a work receives that designation? This session will place the basic rules of copyright law in ordinary terms, and put their usage into context. Mar. 7, 2:30-4:00 p.m. ET - Presenting "Understanding and Defending Copyright in Your Library: An Introduction - Part 2" (webinar) for ALA Editions. Session Description: Building upon part 1, this session will tackle two important areas to our libraries: Fair Use and ebooks. Fair Use is a critical part of the U.S. copyright law, yet do you know that there is an actual test to determine if the use is fair? As for ebooks and other digital materials, it is important to know where they do (and do not) intersect with U.S. copyright law. Given that digital works are generally licensed and not sold, what should we be advocating for on behalf of our libraries and community members? Mar. 27, 9:00 a.m. - 4:00 p.m. ET - Presenting "Copyright 101: Staying Legal" (on-site workshop) for for Southwest Florida Library Network (SWFLN). Description: We are often quick to make decisions about the use of someone’s content, based on what we believe copyright law states. Unfortunately, most of what we know about copyright is hearsay or guesses, yet everything we do in a library is guided by copyright law. 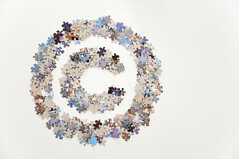 This workshop will provide a firm foundation in the fundamental rules of U.S. copyright law. It will help you stay legal and out of trouble with copyright owners, by helping you understand, explain and use the law in your library community. This is a very details fact sheet. If you are a musician, who wants to regain control of your copyrights, please read the fact sheet carefully, then consult an attorney. An attorney, who is versed in music copyright, can help you ensure that you pursue the correct path at the correct time. Another tragedy happened this week in a K-12 school and the media showed us video of panicked students fleeing from the school. Thankfully, they knew how to get out of the school. Each day is a good time to look around your facility and see if it is obvious to someone how to get out in an emergency or even if it is obvious to tell if there is an emergency. I still remember being in graduate school at the University of Maryland and walking into the student union when many people were leaving. Of course, the student union was a busy place, so that didn't seem unusual and I wasn't the only person walking in. Yes, there was a beeping sound, but it didn't sound like an alarm (or at least an alarm I was familiar with). Thankfully, it was only a bomb scare and my mistake was not harmful. 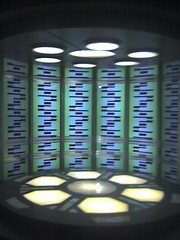 What I learned is that alarms do not all sound the same and that has informed how I react to beeps! 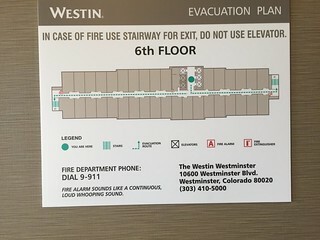 On every floor of the Westin in Westminster, CO is signage with the evacuation plan. Notice that it contains information on what the fire alarm sounds like ("continuous, loud whooping sound"). That is good information, even if your not quite sure what "whooping" sounds like! 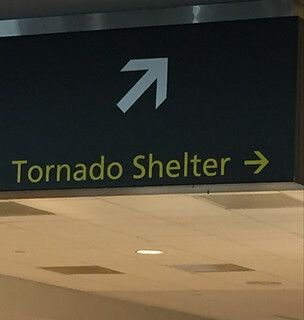 In the Denver International Airport (DIA), there are many, many signs pointing towards tornado shelters. Some are text, while others are text and image. Denver is a massive airport, so it is good that there are many shelters available and lots of very obvious signage. While you might not want signage this big, does your facility have signage which will help people leave in an emergency? Is it noticeable? Is it accurate? If you find your signage wanting, please take time now to improve it. And then test it with your staff and your community. Make sure that in an emergency, it is obvious what people need to do. Description: Various aspects of harmonization at European Higher Education Institutions (HEIs) that offer programs in Library and Information Studies (LIS) have been studied since early 1990s. Since 2004-05 – when a project on Curriculum Development was funded through Erasmus program – up to 2016, there were no projects on education in Library and Information Science funded by European Union. The main goal of this paper is to present and discuss the results after the first year of the Erasmus plus project entitled European Information Science Education: Encouraging Mobility and Learning Outcomes Harmonization (EINFOSE). The project seeks to investigate how these barriers could be eliminated or lowered. STEM literature notes that graduate students gain experience in mentoring and leadership. It provides experience in supervising others. What is fake news? The intent to mislead the reader in ways that serve a social or political goal. It cannot be verified. How we understand truth is a western concept tied to the ability to create and reproduce scientific results. Fake news undermines the foundations of the scientific methods. Trust comes from the ability to produce reliable tools. However, governments have made claims that no one could believe and that sowed distrust in our institutions. Fake news allows people to find excuses for what we want to believe. Fake news mean unreliable sources. Reliability is a scale. One role information professionals can play is to uphold standards for quality and reliability. Who will be soldiers against untruth? This presentation is an outgrowth of the news literacy project. In 2017, Jones worked on a new faked news project in Illinois. Participants define their news landscape. Participants encounter examples for fake news. Participants find out why the library is the best place to get news. Engage participants to consult the library and to gain fact-checking skills. Truth decay: erosion of clear line between fact and fiction, widespread lack of trust in the news. What news do you receive close to home? Where does it come from? Is it correct? How do you know? Look at the local news. What are the sources? Look at the state and where you are getting that news. Where do we get national news? Where do we get international news? Chu showed a legitimate article, where the accompanying photo was a mashup/fake. There are handouts already that can be used in teaching how to discern fake news. Jones is developing slides that could be used broadly to teach how to discern fake news. Information professionals have skills and content knowledge. Where do information professionals learn to teach? Very few actually learn how to do teaching as part of their MS programs. Teaching is a skill set, science and art. Teaching is not well learned on the job. Teaching is core to the work that most information professional do. Teaching to teach requires a host of skills and many elements that go into good teaching. Additionally, they need to understand some specifics around fake news. There are a range of cognitive challenges that must be overcome, including that impressions once formed will endure, confirmation bias, and resistance to change. People may selectively avoid new information. It can be easier to identify weaknesses in the arguments of others, but not in one’s self. Pre-service preparation is critical for our emerging information professionals. Is there an opportunity to collaborate with journalism faculty? There could be informal and formal collaborations. An example that has occurred was an unconference. Noted that there are other people besides journalists with whom we could collaborate. Journalists are reliant on libraries. Can we help end users understand how news stories are created? That would be helpful for our students. School librarians can have a role in helpful us tech how to teach. Digital natives are skilled with technology, but not necessarily with understanding the content. We are asking people to be skeptical, which requires more thought. Can we (academics) encourage with the public and uphold our profession? Is trust declining in libraries, which are civil institutions? We know that trust is declining in civic institutions, but there is limited data on libraries (outside of Pew data). Fake news is entertaining and is part marketing. Can we deliver information in a way that is more eye catching? Will our associations and institutions support us in the public sphere if we confront fake news, teach about fake news, etc.? Will our associations help us make positive social impact? Will our academic institutions support us, rather than limit our engagement? There is a social risk to this work. Can we get resources out into our community? For example, getting students and alumni to go to town halls, etc., to answer questions from participants with verifiable information. An example of this is Radical Reference, which began during the Republican convention under George W. Bush. Can we engage with peoples’ rational minds? Engagement requires respect and openness. There is a difference between access to information and impact of information. Can we (librarians) be one of the voices on TV as commentators, etc., talking about sources, etc.? Can we do that recognizing that the work would be fraught with emotional and social peril for the individual? Can we work with search engine and online social networks to help them filter out fake news? These issues exist outside of the U.S., although sometimes in different ways. They use Slack.com, which is free and easy. Cloud-based which allows for a variety of different content to be incorporated. It can be real-time or asynchronous. Online collaboration platform. Conversations were in different topic channels. A place to pose questions and have meaningful exchanges. Librarians were about to share artifacts, including documents and photographs. In using this data with their class last spring, LIS students wanted to ask a question in LINQ. Faculty facilitated the interaction. Now some faculty are using Slack to teach their classes. There are private channels on Slack. She is using it for submitting assignments. What is the role of an LIS program? Data analysis led to finding common themes on competencies. How do make sustained CE worth their time and money? How to competencies needed and format intersect? Diversity levers - social justice, human dignity, equity in access to information, equity in information preservation. Where in the LIS curriculum does this occurs naturally? “Practicum in information agencies” is the one required course where this can occur. This can also occur as a class assignment. Adkins and Buchanan walked through an example. Students worked with materials at the Black Archives of Mid-America during a fall course (2016) and then during spring break (2017). Another way to put students in a diverse setting is through study abroad: South Africa, Ireland/UK, and St. Lucia. Students wrote reflections everyday on the trips, which helped them learn from the experience. Also did a service learning trip in Joplin, MO. They also have a service learning class on community leadership. The digital libraries class worked with the Cambio Center on a project. They noted that they still have challenges. The tools that measure changes in beliefs about diversity are subjective and imprecise. The ACRL Framework for Information Literacy for Higher Education was adopted January 2016. They then did a interview study with 15 instructional librarians. Semi structured questions. Conducted through Skype. Looked for successes, challenges, and evaluation techniques. Asked about pedagogy techniques. Respondents noted a wide variety of ways for assessing student learning, including no assessments yet. The Framework does require a change in thinking. Librarian attitudes about the Framework vary. We should encourage our students to engage in critical reflection and debate about the frameworks strengths and weaknesses. We should move away from a strictly skills based approach. There is more research that needs to be done on the adoption of the Framework. What are best practices in LIS programs for teaching students to then teach using the Framework? Sue Kimmel, Elizabeth Burns, Jeffrey DiScala, Meredith Parker - Old Dominion Univ. Students actually want help 24x7. Their students are nontraditional with jobs and family. Few access existing resources for help. Students into program complete coursework during times other than traditional business hours. After 6 p.m. and on the weekend. At the time of their survey, they did have a requirement that students come to campus for a three day boot camp (summer institute). 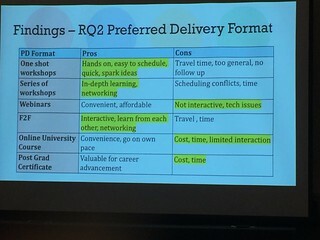 For ODU students, online, asynchronous learning was very important. They would not have been able to enroll otherwise. Most of their students are from Virginia. All are school media students. 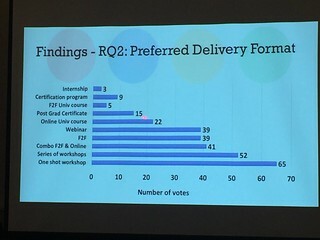 What do their students perceive to be the benefits on online advising? Why do students seek assistance? Online advising is seen as being convenient. It allows students to feel a sense of community. Obtain more advanced notice of deadlines, etc. Their research is using the @BlueZones and their work is not yet finished. Engaged scholarship: education applied to social problems and issues faced by individuals, local communities, organizations, practitioners, and policymakers. 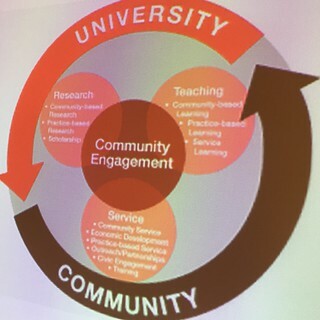 Community engagement is at the center of research, teaching, and service. This session is based on a 2017 paper of the same title. Prompts for each speaker will be the same. Tell us about a time when you experienced discrimination as a faculty member. Backhanded compliments in student evaluations. Question: Are our associations and institutions ready to support faculty who are being harassed because of the faculty member’s diversity? Inappropriate questions from students and faculty. Colleagues who do not openly support a faculty member of color and do not confront people who aggressive towards faculty of color. Support needs to be open, loud, constant, continuous. We need our colleagues to not be cowards. When a faculty member of color’s story is not believed. Being challenged in class and on student evaluation because the faculty member’s intelligence is not acknowledged. Needing to conform to the decorum of the majority. Inappropriate assumptions based on a person’s last name. What do you want the rest of the world to know about the experiences and/or needs of faculty of color? Realize that faculty of color are not being too sensitive. That it takes a lot of work to educate individuals one at a time so those people can provide the support and protection that is needed. It is everyone’s job on the faculty to understand the situations that are having a negative impact on faculty of color. The stress is real and it can cause illness. The initiatives that are bringing faculty of color into academia do not assure retention. Faculty of color tend to follow research agendas which may require more work due to the level of community engagement require. That may mean that the person may have fewer publications when going through tenure review. Faculty of color are expected to over perform in order to be seen as equal. You cannot just hire one person from a diverse background. That person will be seen as a token and that person does not adequately represent the diversity in the community. Develop cohorts who can support each other. Be willing and able to listen to people of color who are speaking up and placing information in the public forum. Don’t just invite people of color for photos. Invite people of color to be a part of your research team (co-PI). If you are researching diverse populations, do that work with faculty from those diverse populations. LIS associations need to do more than talk about diversity. Can they do something to broaden the diversity of the associations? That faculty of color need communities of support inside and outside of academia. Know that some faculty will be unable to change so they are fully accepting of faculty of color. Faculty of color need to keep themselves safe, sane, and healthy. Respect that need. Support for faculty of color needs to begin when they are doctoral students. We are anxious about new things and how to incorporate those things into our pedagogy. He connects data science with knowledge management and LIS. Check their web site for a list of core courses and electives. INFI 300 (Foundations) was a mandatory course, but is now an elective. Students learn to conduct original research. In the end,students can choose to do a paper or a creative arts deliverable (paintings, sculpture, music, etc.). Students write an artist’s statement with the deliverable. Students also learn to showcase and display their work. There is an article on this in JELIS. There is also a traveling exhibit. Question: if students draw an information professional, would the drawing be different than a librarian? Librarians have been concerns about stereotypes since the early 1900s. 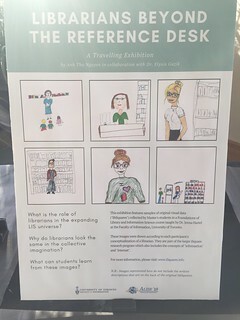 Consider having students draw what they believe librarians so and then have them reflect on the difference between the drawing and what they have said about librarians. For example, did a student say that librarians are involved in technology, but the person drew a person surrounded by books? From MLIS to MI: Changing a Program to Expand Community and Opportunity. The MLIS is a medium fish in a big pond. They formed a task force in 2013. Final report in April 2014. Undergraduate students were not coming into the MLIS program because of the program name and image. They decided not to create a second degree program but to renovate the current degree. It became the Master of Information (MI). At Rutgers, you cannot change the curriculum when you change the name. Official state in fall 2015. Creation of integrated program that leveraged expertise. Collaborative. They now have a dual degree pathway with the undergraduate degree. Currently 10-20 applicants per semester. Enrollment has gone up. 130% growth. More professionals in the program. LIS traditional still the anchor store and a vibrant community. The curriculum committee had 10 people. They met sometimes several times per month. In terms of manpower, some of the work was done on-load. Some course revisions were done with buyouts or additional pay. They had practitioners help redesign courses. They used adjuncts to fill-in teaching slots. They see no problems with their upcoming ALA accreditation review. They communicated frequently with their alumni, and included data. Comment: Make as many changes in the current structure as possible, then change the formal structure to match it. Most of Rutgers programs are 100% online and 100% on campus. Dietmar Wolfram began by talking about some of the current specializations that exist in MLIS programs and allied degree programs. ALISE wants to expand to include the emerging and expanding areas that our programs/schools are engaged in. There is one mandatory course, then students select courses that match the person’s trajectory. Some courses are offered in over academic programs. Courses emphasize the proactive roles of archivists. UCLA’s Department of Information Studies emphasizes social justice. How has the department benefited from archival studies? Emphasis on evidence supports the school’s social justice concerns. Multiple points of intersection with other areas of the department, as well as other academic departments. Built tighter connections with external communities. Helping students to connect between their background and communities to their future careers. The classroom must be a safe space. Rethinking class lengths to allow for more depth during a class session. For example, having a class that meets in 8 hour blocks several times a semester. What is the LIS profession? Who are our students? How can we brand our programs to demonstrate the versatility of our degrees? Given demographic trends, how can the many related associations be sustained? Should ALISE be the leader in developing alternatives to....? UNT uses (informal) ”programs of study” to provide breadth to the MLIS program. Their PhD. program uses 33 external faculty who are involved with supervision and mentoring. This is in addition to 16 faculty in I.S. One I.S. Faculty member must be on the student's committee. One PhD, two master’s degrees, and some certificates. In a dual degree, the number of credits is reduced. This is helpful particular for students who want to go into academic libraries, where a second master’s will be particular helpful. Most specializations have a faculty lead. That person advises all of the students in the specialization. It every specialization or dual degree has students all the time, but all have had students in them. Specializations have required electives and free electives. The specializations help with course scheduling and the hiring of adjuncts. Once you know how many students are in a specialization,who can figure that out. Dual degrees must be approved by each department/school, then the campus, and the state. Specializations are approved by the Board of Trustees. He noted that most employers do not ask to see a student’s transcript. Most students now take core classes in their first year, which helps with course planning. Almost engaged in constant curriculum review. From a user experience program. How can we help? Sherman delivered a call to action, rather than talking about what his program does. Gilliland asked what is the profession that we are trying to serve? Are these professions ready for the changes our students might bring with them? Rosenbaum - the problem of recruiting diverse populations has been a concern since his work in academia since the 1980s. He noted the lack of diversity in the room. IS students are not interested in the L.
Sherman - we should be looking at educational programs, not just those that grant degrees. We need to be aware of our competition. Hawamdeh - can people do the job? That is more important that a grade. How do we integrate competency based education into what we do? Rosenbaum - competencies depend on where the student is going to work. What is the profession that we’re trying to education students for? To what extent do undergraduate programs affect the culture of your school? The MLIS degree requires a demonstration of LIS overarching concerns. How does this work with the structures that were discussed? Sherman - they offer a range of culminating experience. They suggest that students look for projects that will be relevant to hiring managers or projects at their current workplace. Hawamdeh - have advanced seminars and independent studies. Students might produce a publication. Gilliland - her university requires either a thesis or a portfolio option. In what way do knew programs contribute to the information professions? How do they affect our mission? Sherman - concentrate on mission. It is a losing proposition to focus on defining what you are. Rosenbaum - They looked at their undergraduate students and creating undergraduate majors. About 10% of undergraduates do not know what they want to do. What could they go with that 10%? They looked at what they could do with that group? They allow students to take graduate classes in their senior year, so that students can quickly get an M.S. degree. Most though are currently interested in the I.S. Degree. Wolfram - Introducing students with related undergraduate classes can provide a gateway to the LIS degree. It opens up career options for students. What kind of value proposition to your pick to a partner in a dual degree program? Hawamdeh - Students want to know what the degree will do for them. Are programs aware of how many of their students are already practitioners? 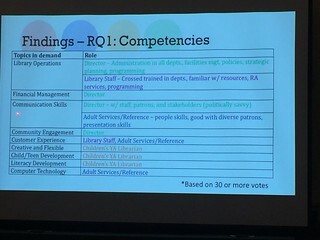 Gilliland - Some applicants in archives enter the profession because they feel their community has not been well served by the archives profession. 32 of the yet 65 ALA accredited programs are fully online. Students become active participants. Student centered learning moves students from being passive to being active. The group project is in a web design course which uses WordPress for the web design. It is a six week project. Assessments : Status reports (1 page each), progress report (longer, half of the final report), presentation, final report (progress report plus other information), web site, and peer review survey (SurveyMonkey). Evaluation : points are given for the presentation, final report, web site, and peer review. 40% of the final grade. Establish the rapport that communication is always open, using the tools available. One group discussed assessment and evaluation of group work and then deviated into talking about student feedback on their group mates. Talked about communicating with students. Keep in mind that in the work world, not everyone works at the same level and assessing your peers in normal. Failure is okay. Getting comfortable with teaching online, etc., takes time. How do we support the technology for online education? Where are the resources for supporting the instructors? Faculty are hired for research, yet are told that they need to keep up to date on teaching technology. Faculty may be required to troubleshoot the technology problems for their classes, because there is no IT support. Does the university value online the same as face to face? When you teach online, be explicit with the instructions you give students. Lots of evidence of the erroneous reliance of “common sense” instead of critical thinking in recent discourse on misinformation, fake news, and propaganda. Common sense is not based on systematic observation. How can we teach critical thinking so students can distinguish sources and teach the skill to others? They used two cases with students (online class) and then studied the results. Both cases provided ethical and managerial dilemmas. The study was qualitative. They identified three type of mindsets: idealist, pragmatic, and skeptic based on students written discussions. They looked for thoughtful, analytical and reflective discussion as well as leadership, decision making and problem solving skills. Did students Apple management and ethical theories? Utilizing problem based case studies in learning activities is an effective approach for cultivating a critical thinking mindset. Responsive. Curriculum design to intellectually engage and challenge students in order to cultivate critical thinking mindset in addition to professional skills. They began with a discussion of what health literacy is and provided definitions from the World Health Organization and others. Then there was a discussion of physical literacy. “Physical literacy is the ability, confidence, and desire to be physically active for life.” - Aspen Institute Sports and Society. Physical literacy does not assume physical ability. Oklahoma is the 43rd worst state in terms of the health of its residents. Rubinstein interviewed library staff about health and health literacy. Lenstra did research in North Carolina. NC is in the “middle” of the country based on health metrics and physical activity levels (https://stateofobesity.org). He also interviewed staff. Jointly their study is “Movement based programs in the U.S. and in Canada: A survey.” Their survey received responses from 1418 different public libraries. Responses came from urban, suburban, and rural libraries. Programs are being offered for all age ranges. They are still digging through the data. There is an ongoing debate about the role of libraries in community physical activities. There are libraries that have gym passes which can be checked out. How do we educate students they are prepared to foster these literacies? Should they be prepared? If yes, can they be prepared to work with people of all physical and cognitive abilities?